A city filled with elegance, beauty, and charm, Madrid is the perfect place to spend your holiday no matter if you’re on a solo adventure, a romantic getaway, or a memorable vacation with family and friends. Hotels and resorts that you will find in Madrid resonate with the city’s beauty, from the gorgeous views they may offer to the breathtaking artwork and decor that fills their rooms. Barceló Imagine is a luxurious and modern hotel in Madrid that exudes quality and excellence, as do all Barceló Hotels and Resorts. Guests can choose from eight different room styles from the deluxe to the Grand Suite. All of their 156 rooms come with free Wi-Fi, a smart television, and a media hub and are fitted with exclusive amenities and lush linens. The Grand Suite provides a magical atmosphere that comprises sophisticated decor, spacious bathrooms, a separate living room and bedroom, and a terrace with spectacular views of the surroundings. In-hotel amenities include a fitness studio, swimming pool, sauna, and a sky lounge to have drinks and relax in. Located next to El Retiro Park in Madrid, the Petit Palace Savoy Alfonso XII is an ideal choice for family vacations, weekends with friends, or a romantic couples getaway. The hotel is housed in an old 19th century palace and retains its Old World charm while implementing modern luxuries and comforts to make your stay memorable. You will be able to enjoy the rooms and their stunning views of Retiro de Madrid while indulging in the in-room amenities, such as free Wi-Fi, an iPhone and iPod dock, or the in-room computer, which lets you stay in touch with family, friends, and the rest of the world. With 471 rooms, of which 51 are suites, the Westin Palace is a popular and wonderful choice when selecting accommodation in Madrid. Guests will be right in the middle of Madrid’s historical landmarks, cultural sights, local attractions, museums, and art studios. Those who are looking to get a little shopping done will love that they are amidst one of Europe’s most renowned shopping destinations, filled with traditional products, exotic goods, and gourmet delicatessens to take back home. While there be sure to book a bicycle tour at the hotel concierge, which is a great way of getting an escorted look at all the sights and sounds with an expert guide. 60 Balconies Recoletos offers a unique accommodation experience in the Barrio de Justicia right in the heart of Madrid. The two historic buildings comprise a range of fully furnished studios and one or two-bedroom apartments that allow guests to really feel at home and get an authentic experience no matter whether they’re there for one night or one month. This gives you the freedom to get truly comfortable, invite friends over, and really settle in to the cultural experience. Complimentary services that come with your stay include daily cleaning, breakfast, Wi-Fi, 24-hour check-in, multilingual assistance, international channels on the television, and luggage storage. For a small fee guests can add a spa experience or a personal tour guide to show them around the city. Artiem Madrid is an urban hotel that focuses on being eco-friendly while inspiring their guests to have an authentic adventure in the gorgeous city. Perfect for a work trip or a well-deserved vacation, and able to accommodate single travelers as well as groups, the hotel is one of the most renowned in the area. The bedrooms are spacious and decorated with comfort and style in mind with features like a king-size bed and a refreshing rain shower. In-hotel amenities include two lounges where you can dine and drink as well as the Green Fridge, which is a 24-hour area filled with salads, snacks, coffee, and other drinks to energize you throughout the day. 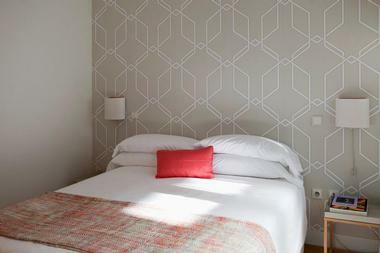 Owned and operated by a young couple who love meeting travelers from all over the world and getting to know each other’s cultures, Artistic Bed and Breakfast enables you to have a unique experience where you really get to enjoy the city of Madrid, its sights, sounds, and people. 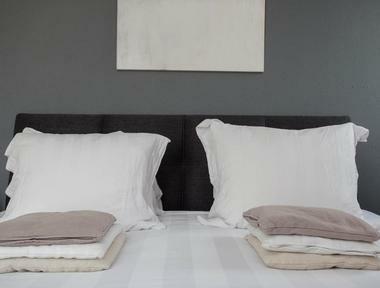 There are only six rooms at the B&B, ensuring that each guest receives personalized attention and a quiet atmosphere. 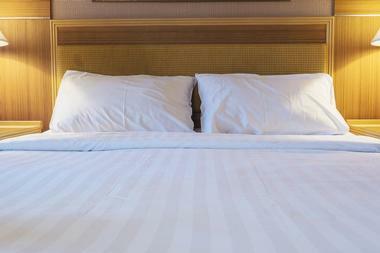 All of the rooms are uniquely decorated and include amenities such as temperature control, free Wi-Fi, en suite bathrooms, comfy mattresses and linens, flat-screen televisions, and access to the hotel’s common room as well as a delicious homemade breakfast to stay your day off right. 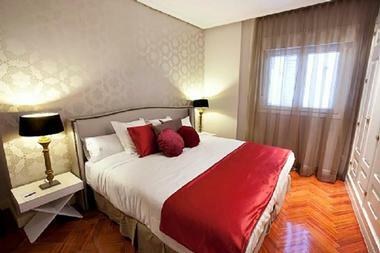 The B&B Hotel Puerta del Sol is a modern and elegant three-star accommodation right in the heart of Madrid. Guests will be within walking distance to amazing attractions and sights such as the Puerta del Sol, Gran Via de Madrid, the Plaza Mayor, and the Prado Museum. There are 74 rooms to choose from, each with an innovative design and comprising an exclusive Airbed, flat-screen television, work space, an electronic safe, and a minibar. The bathroom is spacious and has a rain shower as well as a hair dryer and bathroom amenities. 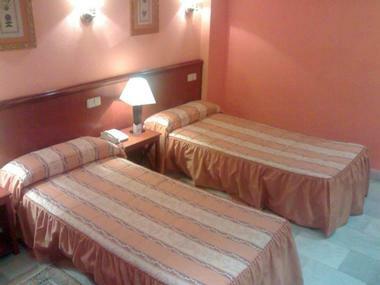 The Premium Room is a popular choice with couples as it includes a large terrace that overlooks the Puerta del Sol. Surrounded by the Royal Palace and the Plaza de Oriente, Central Palace Madrid focuses on being luxurious, comfortable, and spacious so that guests have the best vacation experience. 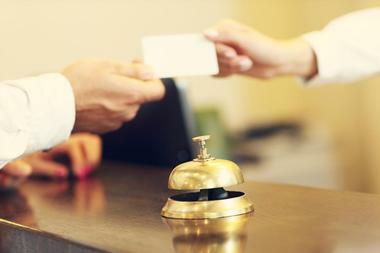 There are several services and facilities offered by the hotel to ensure customer satisfaction, such as 24/7 reception, multilingual assistance, complimentary Wi-Fi, luggage storage service, and airport transfer services. There are any rooms to choose from based on the number of people staying, the view requested, and the amenities needed; the most luxurious are the Suites Central Palace, which have a separate living room, antique furnishings, flat-screen televisions, and complimentary coffee and tea throughout your stay. 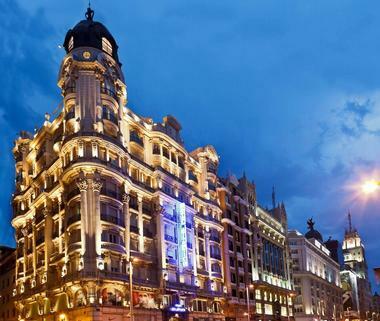 Circulo Gran Via Hotel is a stunning five-star hotel housed in the Casino Gran Via Madrid building. 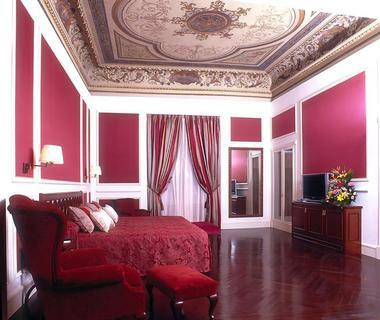 The magnificent neoclassical hotel is situated in the heart of the capital and only accommodates adults. Guests will be able to easily access the city’s main attractions such as the Royal Palace, Plaza Mayor, and the Puerto del Sol. Amenities and features of the hotel include it being 100% smoke free, having a fitness room, three meeting rooms, and a spectacular terrace to enjoy the surrounding views. Bedrooms and suites vary in size, view, and amenities; the Circulo Gran Via Suite is the most luxurious of them all and has a separate living room, a mini-refrigerator, work space, and much more. DoubleTree by Hilton Madrid - Prado is a boutique-style hotel that is right amidst the hustle and bustle of Madrid’s city center. Guests will be within close distance to the Atocha train station, the Las Letras neighborhood, the Retiro Park and Botanical Garden, many museums, and numerous artisanal shops, bars, cafes, restaurants, and outdoor terraces. The historic building is filled with charm, from the architecture to the hotel’s decor. You will be able to take advantage of the hotel’s on-site restaurant and bar, which serves a combination of Mediterranean and Japanese food, in addition to free Wi-Fi, and complimentary access to their fitness room and business center. With locations in Amsterdam, Barcelona, Hamburg, and Madrid, Eric Vökel aims to provide boutique apartments for travelers to stay in – apartments that will let them have a truly authentic travel experience as it immerses them in their surroundings, giving them the opportunity to shop in the local neighborhood stores, learn about their culture, and mingle with the people. 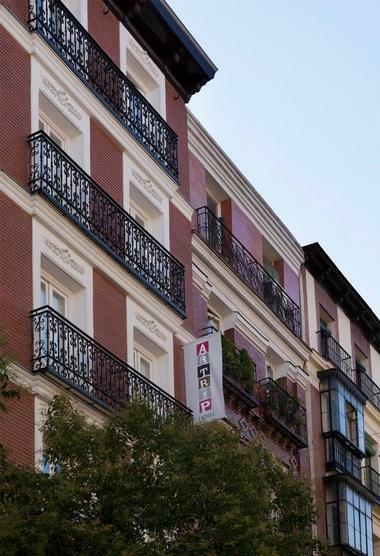 Eric Vökel Madrid Suites can be found in the Malasana District, which has a gorgeous surrounding and great public transportation, making it easy to get anywhere in the city. You can choose from two bedroom and three-bedroom apartments as well as penthouses. All of them have two or more bedrooms, spacious bathrooms, a living room with a fully equipped kitchen, and a balcony to relax on. The Gran Meliá Palacio de los Duques in the cultural center of Madrid is not just a hotel, but rather an extraordinary work of art as it was a 19th century palace. The hotel has an Elizabethan facade, avant-garde decor, and provides luxury service with a traditional touch. Hotel features include a seasonal swimming pool and hot tub with views of the Royal Palace, a solarium, a cocktail bar, and a wellness center. Guests will also love exploring the onsite garden, which is a green haven and unique to Madrid. While there, be sure to indulge in delicious cuisine from one of their three restaurants: The Dos Cielos Madrid, Coroa, and Montmartre. Hostal Acapulco is a family-friendly hotel that opens its doors to visitors from all over the world, no matter if they’re a single vacationer or traveling in a group. The accommodation is a great place for visitors to meet fellow travelers, mingle with locals, and really immerse themselves in a cultural travel experience. The convenient location, right in the middle of Gran Via and the Puerta del Sol, makes it the perfect home base for your explorations. Each guest will have a cozy and private room, along with an en suite bathroom, for them to relax in after an extensive day of adventure. Guests will find Hostal Met Madrid right in the middle of the popular Austrias District, amidst various attractions and sights such as Plaza Mayor, Plaza de Oriente, Almudena Cathedral, San Miguel Market, the Prado Museum, and the Royal Basilica of San Francisco El Grande. The hotel allows guests to easily access the subway or other modes of transport as well so that you can explore places a bit out of walking distance, such as the Real Madrid football field. The gorgeously decorated and spacious rooms were recently renovated, giving it a more modern look while maximizing on comfort. Services and amenities include personalized service, private bathrooms, individually temperature-controlled spaces, flat-screen television, Wi-Fi, and various safety surveillance features throughout the hotel. An urban hotel right in the cultural heart of Madrid, Hotel Artrip is located amidst some of the most stunning art galleries in the world: The Reina Sofia Museum, the Thyssen Museum, and the Prado Museum. Resonating from its surroundings, the hotel itself is a work of art from which visitors will be walking distance from the works of Picasso, Monet, Dali, and other renowned artists. Guests will be able to live like the natives, wandering around the pebble-stoned streets, meeting the locals, finding exotic gifts at the nearby Rastro flea market, and visiting major landmarks such as Plaza Mayor, Puerta del Sol, and Palacio Real. 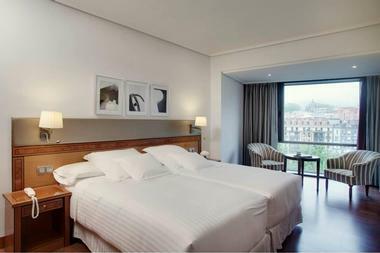 Hotel Atlántico is a gorgeous four-star accommodation in the heart of Madrid. Guests will be right in the middle of the renowned Gran Via Street, which makes it possible to be within walking distance of the some of the most amazing tourist sites in the area. You will be surrounded by fashion, sports, and culture as you stay among the area’s theatre district, which is always abuzz, while shopping at popular boutique stores, both local and international. There are many room options to choose from, with the most basic single room including world-class amenities such as satellite television, a safe, minibar, and complimentary Wi-Fi. The Hotel Catalonia Las Cortes is the perfect place to stay as you discover the beauty, art, and culture of Madrid. The hotel is housed in an old 18th century mansion that has been renovated to offer the best modern amenities while still retaining its Old World charm. Various amenities offered by the four-star hotel include an internet corner, wellness center, babysitting services, public parking, free Wi-Fi, and complimentary snacks for guests in their snack bar. The in-hotel restaurant, which is run by internationally acclaimed chef Jesus Trujillano, serves delicious culinary concoctions with local and international tastes for you to try while there. A boutique hotel housed in a gorgeous 19th century building, Hotel Icon Casona 1900 by Petit Palace offers exclusive service, amenities, and a location that is hard to come by. 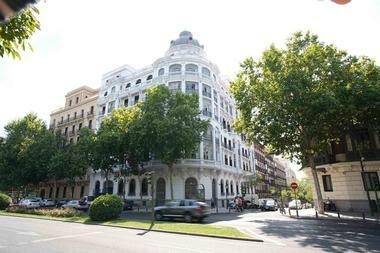 The hotel is located within the Salamanca District, making it within walking distance to popular sites such as Retiro Park and Puerta del Sol. While you can enjoy you the many art deco and art nouveau surroundings that are within walking distance, you may find yourself never wanting to leave the hotel. Amenities offered to guests include a VIP lounge area, access to one of the best restaurants in the city, and a private roof terrace that offers panoramic views of Madrid. 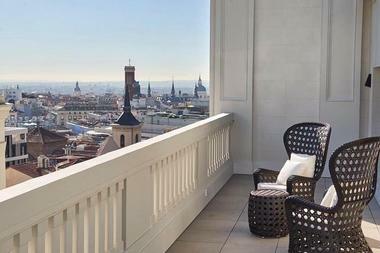 NH Collection Madrid Palacio de Tepa is a charming and historic hotel in Madrid. It is housed in an elegant palace that was designed by the renowned architect who also designed the Prado Museum. Guests will be within walking distance to stunning sights such as Plaza Mayor, Puerta del Sol, the Royal Palace, and the Royal Theater. You will be able to explore and take in the sights and sounds of the La Latina neighborhood as well as Madrid de las Austrias, getting an authentic experience unlike any other. The modern and spacious rooms are flooded with natural light and come with an array of facilities that will make your stay memorable. The Hotel Único Madrid is a timeless space that provides intimate luxury to its guests. Often titled as one of Spain’s best boutique hotels, you will be able to indulge in the many services and facilities that are available, including enjoying the peaceful private garden they have in the heart of Madrid’s shopping district. While there, don’t miss out on the gourmet experience offered by Chef Ramon Freixa, who has two Michelin stars. You can put together your experience prior to arriving at the hotel, giving additional focus to cuisine, tours, or events such as the hotel’s renowned Sunday brunch. The hotel rooms range in style and size and the Grand Suite is one of the more popular choices, coming complete with a master bedroom, fully equipped living room, kitchenette, and an outdoor lounge. Hyatt Centric Gran Via Madrid is one of the many great accommodations offered by Hyatt. This urban gem puts their guests right in the heart of Madrid’s cultural center and is a great home base if you’re there for exploring and adventure. The Gran Via, or the Spanish Broadway, is located right outside of the hotel and is filled with things to see and do both night and day. Be sure to indulge in one of the many culinary concoctions offered at the in-hotel Hielo y Carbon restaurant or have some refreshing drinks at their Mercado de San Miguel bar. 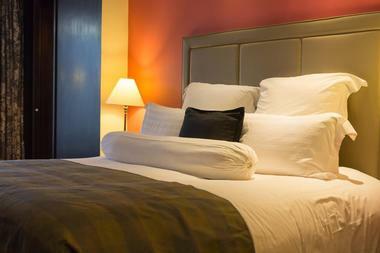 The spacious and contemporary rooms are infused with local flair and filled with amenities to make your stay great. Don’t forget to spend some time relaxing in the rooftop El Jardin de Diana with handcrafted cocktails, authentic street food, and panoramic views of the city. 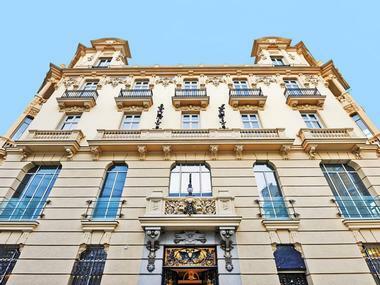 Located in the center of Madrid, Luxury Suites is within walking distance to some of the area’s most popular sites such as Retiro Park, the Fuente de la Cibeles, and Puerta de Alcala. The rooms are luxurious, as the name states, as well as elegant and comfortable. You may decide to stay in one of the hotel’s suites, all of which are individually temperature controlled and have a full kitchen as well as a spacious living room with two satellite televisions. The kitchen comes in handy for those who want to have an extended stay and cook for themselves as they come equipped with all general appliances as well as the necessary kitchenware. 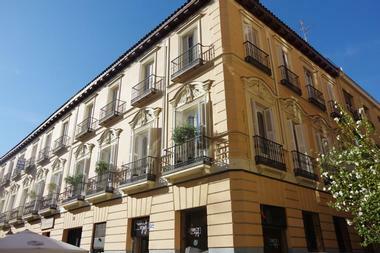 The Pension Salome in Madrid is an excellent accommodation immerses its guests in the local culture. The family-run Spanish hotel offers rooms that are personable and catered to your needs. Located in a 17th century building, guests will find themselves surrounded by luxury, comfort, and all the amenities they need to make their stay a memorable one. Clean, tidy, and great value for money, you will also get amazing views of the Calle del Pez, spacious en suite bathrooms, 24/7 concierge, and free Wi-Fi throughout your stay. While there, be sure to visit the Gran Via and the Plaza de España, which are only a few minutes’ walk away from the hotel. Splendom Suites Gran Vía comprises beautiful boutique suites and apartments for guests from all over the world to stay in, whether it be for one night or one year. The hotel is perfect for romantic holidays, family vacations, or whatever brings you to Madrid, and has many services and amenities to make your stay memorable as you explore one of Europe’s most renowned places. You can enjoy the many tourist attractions, near or far, as the hotel is connected to all main transportation networks. 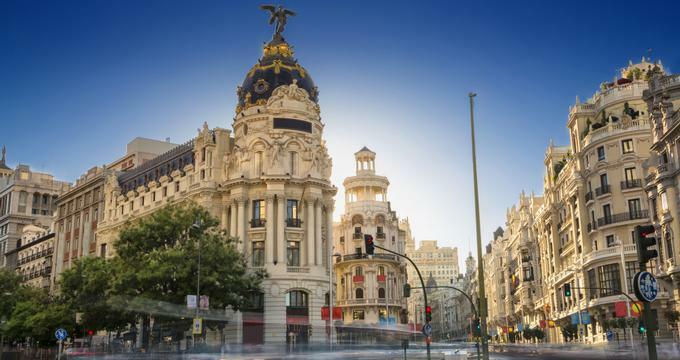 Guests will be within walking distance to the famed Gran Vía, Puerta del Sol, Plaza Cibeles, and Plaza Mayor. There are 26 suites or apartments to choose from, all renovated and decorated to offer modern luxury and the comforts of home. URSO Hotel & Spa offers their guests what they call “the URSO experience” – an unrivalled immersion into the beauty and culture that can be found in no other place but Madrid. The hotel is located in the bourgeois neighborhood of Chamberi, surrounded by shopping centers, embassies, the Royal Palace, and the golden triangle of art galleries: The Reina Sofia Museum, the Thyssen Museum, and the Prado Museum. Their bedrooms are absolutely stunning, with minimalist decor working with the natural light that floods the space, and range from the Double URSO to the URSO Suite Terrace. The latter is a luxurious option that includes a separate living room, a marble bathroom, a dining area, and of course a huge private terrace with amazing views of the surroundings.